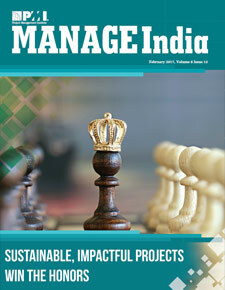 Chapter Board Position Alignment with PMI Role Delineation Study â€“ This exercise is being led by Pritam D. Gautam with inputs from board and supported by Amit Aggarwal directly in the initiative. This initiative is aimed at aligning our board positions and their role definition with PMI's Role Delineation study exercise which is targeted to standardize board positions and their roles globally for all PMI Chapters. The exercise will go through few round of reviews and approvals between board, chapter members, PMI before being implemented for future volunteers coming into the chapter board / working within the chapter board from next year. Volunteer Recognition & Opportunities â€“ No chapter can function or grow without volunteers or their active participation in chapter activities. As part of our chapter recognition initiative, Pritam as Conference Director for the conference has rolled out the following new placeholder on our chapter website for National Conference 2013 volunteers with details of their profile and their personal experience in the conference, all put together on a single link. This is being updated with details from volunteers who have been left out or whose complete details are being collated. We are going to work out more extensive recognition programs like recognizing loyal members of the chapter (say 7 Years or more) at chapter AGM and few more initiatives soon and details will be shared with the community in following months. One day event at Hotel Clarens, Gurgaon to understand all about Agile and PMI's support of the same. Projects are created & executed by humans. As a leader or manager, let's look into as how to connect with our resources on at the required frequency to help them deliver what is expected. Is agile fit for all? If not, then let's uncover some insights to make different type of projects fit under the umbrella. Humans are complicated, hence the projects created by humans are even further complicated. Revisiting six steps to simplify. Prof Vilas Shah has been training civil servants and practicing managers in Operations Management. He is leading key projects from the government sector too. We caught him for a small chit-chat to understand how differently corporate & government sectors operate on projects. Everybody talks about cloud; one likes to stay on Cloud 9. Know what's all it takes to stay on the cloud. Understand the pros & cons of Negotiation. Also, let's get behind the curtain to understand tactics, counter tactics and shifting of power.